If you’re a traveler who seeks adventure then you simply cannot ignore New Zealand. This tiny little country is simply jam packed with insane landscapes and heart pounding adventures. I would argue that, as an adventure traveler, this is the best destination for you to visit in 2019. The hardest part about traveling New Zealand(NZ) is the cost, just to get to NZ is going to cost you a wallet and a half. 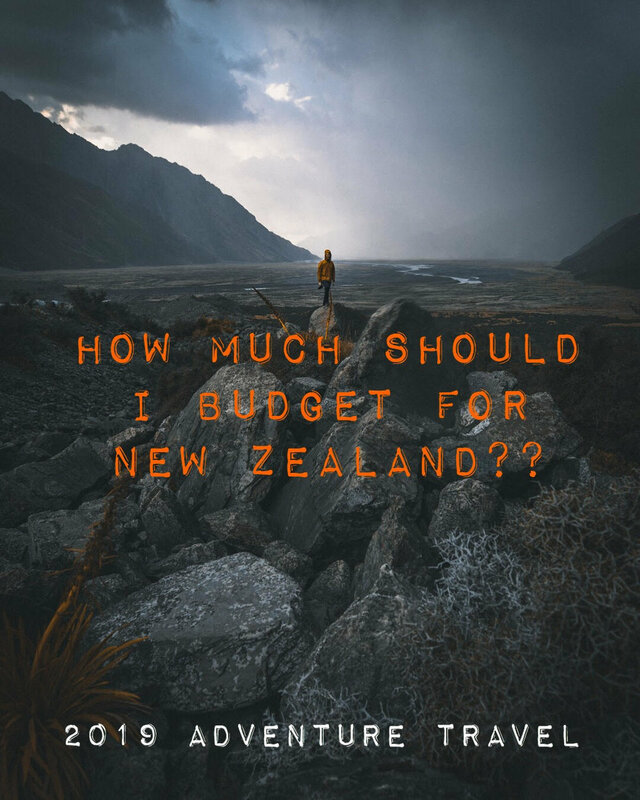 In this blog we break down a daily NZ budget for travelers of all types, backpackers to family holiday goers. We have you covered. We have separated the Daily Budget into 3 cost groups; Backpacker, Mid-range Traveler & Luxury Traveler. NZ can be very expensive, especially if you decide not to book ahead or do your research. NZ is all about adventure, the tours cost money, so where possible put extra money aside to save for the experiences you came to NZ for. All three budgets are based on US dollars, per day, per person. Our images from NZ can be found on Instagram. If you want to go to New Zealand then be prepared to spend a bit more cash than you plan. This budget will be helpful, but there is a high chance you will be excited by additional tours and activities while visiting little old New Zealand. Your money will go quickly on two things; accomodation & eating out. Hostels, hotels & AirBnB’s are expensive in NZ and the cost of a night out is ridiculous. Save the partying and fancy accomodation for your trip to South East Asia. Invest in a camper van, tent and get used to cooking all your own food. A tip: Go in Winter when prices are much lower, plus the South Island is stunning when the snow is covering the peaks. Another tip: If you plan to go in summer, making the most of all the free hikes, be sure to book well in advance & save those precious dollars. Prices inflate as the summer season starts. OMG another tip: Get a tent, download Camper Mate & find all the free campsites. You will save heaps of money on accomodation. If you can, travel in a group of four. Camper prices are far lower if you are splitting the cost four ways, anything over four means you will require another camper. If you are super dedicated to low budget travel then get yourself a tent, gas cooker & learn to hitch hike. NZ can be done as cheap as $30 a day! If you are a 9-5 kind of girl/guy and you save well for that 4 week holiday each year, then this is a good budget range for you. It will allow you to enjoy the tours & luxuries NZ has to offer, in moderation. You may even be able to splurge out on some drinks and the occasional winery tour. Tip - If you are interested in bungy jumping, skydiving or any other adrenaline fuelled activity that NZ has on offer. Look to book ahead of time and select the package deals, you can save a lot of money in the long run. Cash is King for the thrill seeking NZ traveller.. Or a huge Instagram following that you can use for leverage. If you want to see the Southern Alps from the sky, dine on glacial lakes only reachable via helicopter or experience the best wine NZ has to offer. Save all the money you can! The best Heli tours on offer start at $1500NZD & go up. For a private full day helicopter tour offering the best views in the Southern Alps, you are looking at $10,000NZD! No worries, this includes lunch hahaha. If money is no issue or you have been saving your face off for an unforgettable trip to NZ. This is the budget for you. Tip: Be prepared for cancelations. Helicopter tours often cancel due to poor weather conditions. Bonus Tip: If you are looking to check out the wineries; Marlborough & Central Otago are world famous, for good reason. OMG another Tip: If you want to see NZ from a different perspective, check out the cruise options. Many cruise packages include cheaper rates on all the best adventures, heli tours & wineries. Some of the best experiences on offer in NZ are free! It is important to note that some of the greatest experiences you will have in NZ are completely and utterly free! Don’t let money prevent you from exploring our beautiful home country!